This beautiful retro style kitchenette from our friends at Indigo Jamm is a stunning first kitchen for any future Head Chef. In a striking red, with a white chequered splash board, this wonderful wooden kitchen includes utensils, a cooking pan, some salt and pepper pots, as well as those all important oven gloves. The double hob has moving dials, and to complete the look, there's a spotlessly polished stainless steel sink. The kitchen comes complete with a role play clock to keep check on those cooking times - if there's one thing Gordon Ramsey takes a very dim view about it's over cooked food! Build to last and designed to impress, this award winning toy is sure to have any little one cooking up a storm and on their way to a first Michelin Star. 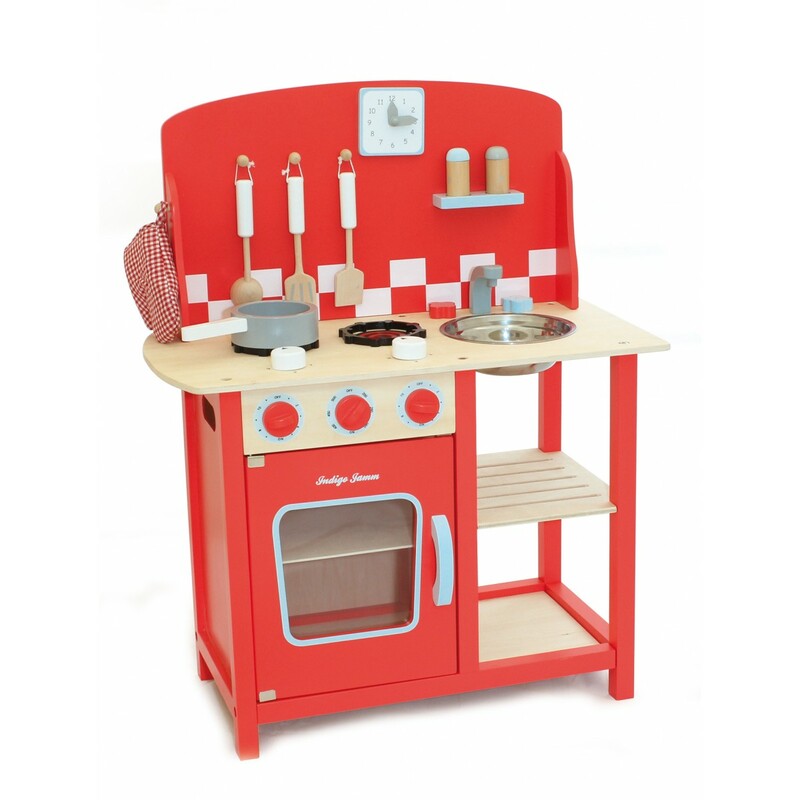 A fantastic first kitchen, it comes with plenty of cooking accessories included, and so has loads of play value. Right start toy awards winner 2012 in the Role play category. A seriously attractive toy, that will make any bedroom or playroom look amazing. Completely British designed, and made in ethical factories.